We've both been through Young a few times, separately and together, but never noticed that it has big balls (and 3 of them!). A couple of weeks ago, while driving back from a work trip to Bathurst (CSU has a campus there, so we’ve both been a few times), Dan left a trail of cherry pits from Young to Cootamundra. He had just bought the first cherries of the season. Literally, the first. There was one grower selling them, and they had just opened their stand about 1/2 hour before he drove through. He bought 3 pints, and ate most of one punnet, spitting pits out the window as he drove. 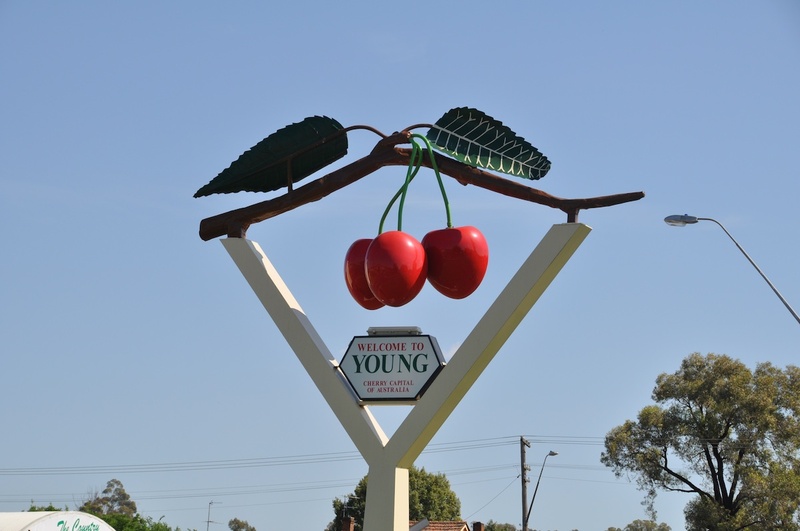 Young, for those not in the know – which is probably about 99.999999999% of the world – is the cherry capital of Australia. It is a small town, 150 km north of Wagga, and because of its climate (1400 hours at below 7 C…they call this a cool climate!) and geography (it is known as the Hilltops region) is ideal for growing cherries, stonefruit, and grapes. So what better thing to do on a warm (35C) spring day than run to the hills in the height of cherry season. 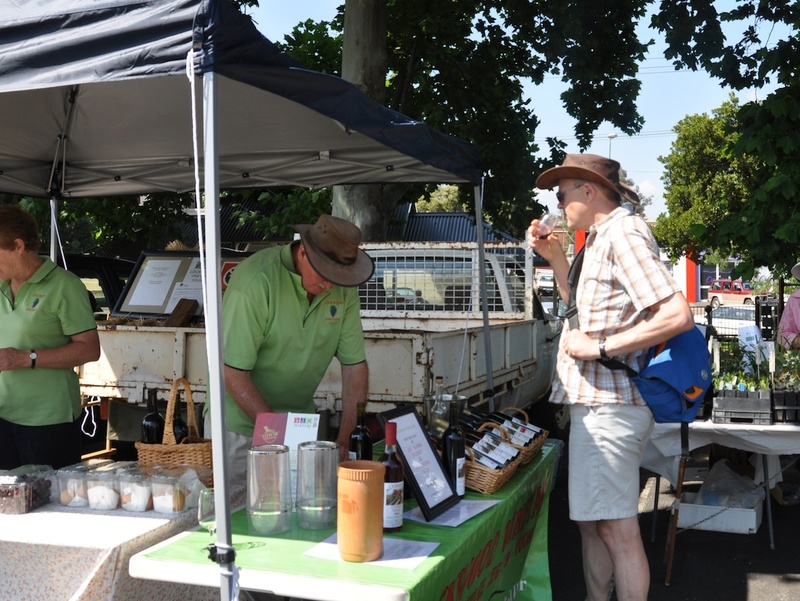 Not much happening at the Young market at 10 am, but Dan managed to find someone selling wine. Lockwood is a very small winery. Most of their grapes are sold to bigger wineries, but they produce a few hundred cases under their own label each year. Take special note of Dan's new kangaroo leather hat! We got into Young around 10 am, just as it was starting to get warm. Being smart people, we (Lisa, Dan, and a friend, KT), slipped, slopped, slapped before we went. Our goal of arriving that early was based on 1) getting out of the orchard before it got too hot, and 2) checking out the farmers market that ran from 8-11. Well, the market wasn’t that special…probably everyone in town either grows, or knows someone who grows, all the fruit and veg they need. 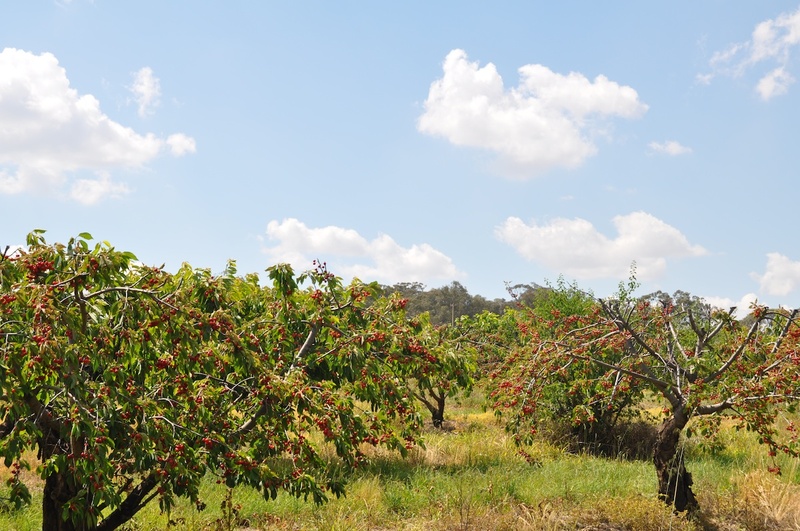 So, after a quick look in the info booth gift shop (also a really great Hilltops region wine shop…must return for that) and a stop at the loo (Lisa is getting used to the outdoor facilities that are prevalent around Australia), it was off to do some cherry picking. It doesn't take long to fill a pail of cherries in an orchard this abundant. Even when you eat a few, picking cherries is a fast process. This is the place that Dan thought looked "too big and commercial"! The sun is frying his brain. The super-friendly woman at the info booth told us which growers were open that morning (she calls each day to confirm) and we found out that all of them were south of town, on the route we had driven in on. We could have gone back as far as Wombat (yes, there is a town called Wombat, hehe 🙂 ), but opted instead to go to the one closest to town: Ballinaclash orchard. Dan later said it wouldn’t have been his first choice, as it seemed a bit too commercial, but it was a great place. 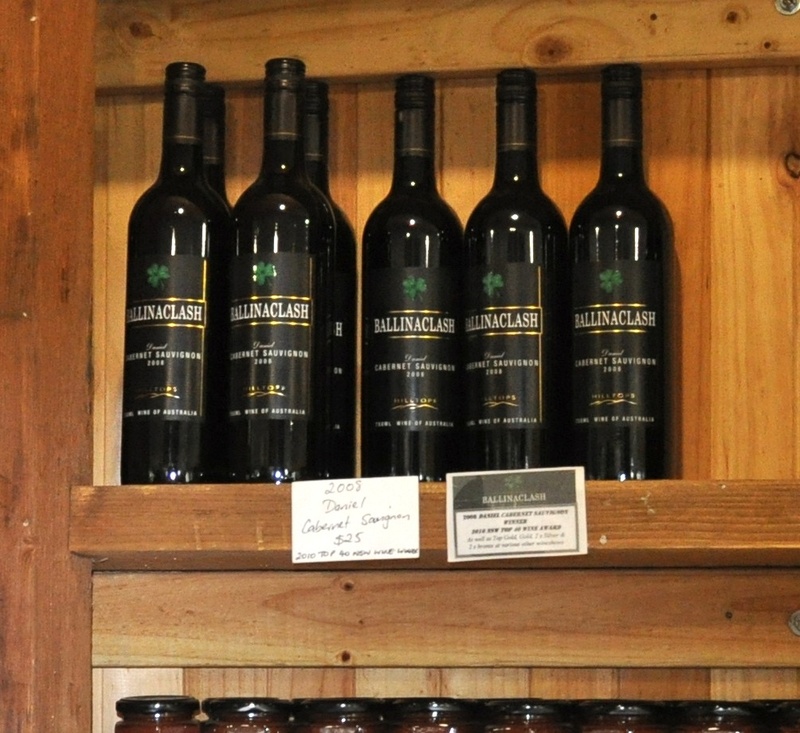 Ballinaclash is a family business, started by a doctor who moved here from Ireland in the 1960s. His family still runs it, and grows a variety of cherries and larger stonefruit, and grapes. We were trucked off to a far corner of the orchard, and in about 30 minutes filled our pails and bellies with perfect – absolutely perfect – cherries. When Dan bought those cherries a few weeks ago, the woman there told him she won’t eat cherries once they have been brought into their cold storage, and we now know why: like the oranges we had a couple weeks ago in Corowa, these cherries straight off the tree were beyond-belief good. Most people never eat fruit this fresh, which is a shame because it is really special. How could we not buy a few bottles of one of the top 40 wines made in NSW, and named after Dan! After weighing and paying for our 5.5 kg of cherries, we stopped in at the shop to see if they had any cherry pies. No, they don’t sell them there (no kitchen facilities until 2012), but did recommend where to get one in town. 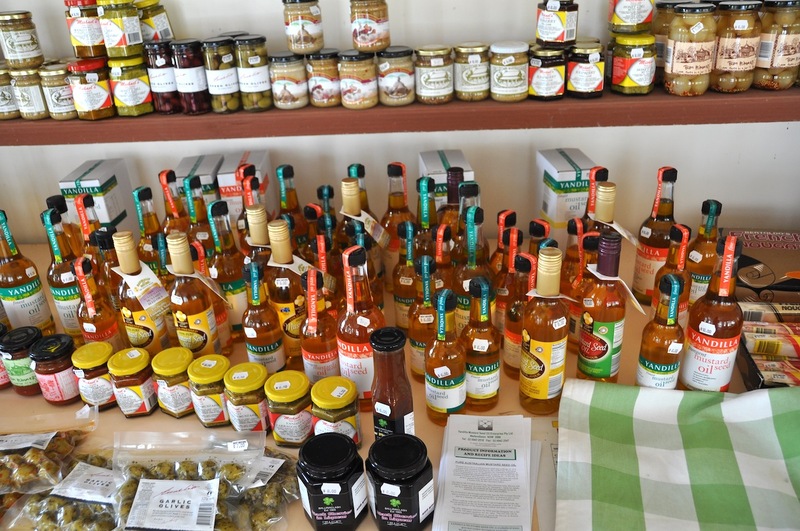 And they had a lot of jams, preserves, and other goodies that we bought. And, of course, since this is Australia, wine. We sampled a few of their recent releases, including a Shiraz that recently won some awards (best cool climate Shiraz in Aus). We bought a few…they name their wines using their childrens’ middle names, and we couldn’t leave without some ‘Daniel’ Cabernet Sauvignon. We then went back into town for what has been described as the best pie (meat, not fruit) in NSW at The Country Providore, a little cafe in Young. Last time we were in Young together, we stopped there but they were out of pies, so we were thrilled that they had a few left. It was good, as far as Aussie pies go, but no better than the ones we buy from Bernard, the French baker in Wagga. Of course, we’re pretty sure that most Aussies wouldn’t consider his pies to be Australian, so they don’t really count. After lunch we toddled down the street to Wilders Bakery for the cherry pie. We assume that farmers go through the orchards and berry patches with snake-whacking sticks before letting people pick their own fruit. Otherwise, Lisa would have been buying pre-picked at the roadside stand. And then, we headed home…until we got sidetracked at Glenn Mohr Farm, a strawberry grower just down the road from Ballinaclash. Dan isn’t a big strawberry fan, and still has nightmares about picking them as a kid at home (Lisa edit: get over it you idiot…that was 40 years ago!). But in deference to Lisa and KT, Dan gave in and went out to the field where we harvested another couple of kilos of beautiful sweet, succulent, red fruit. Red, as in red all the way through, not white in the middle like ones from the supermarket. Ok, now time to head home. 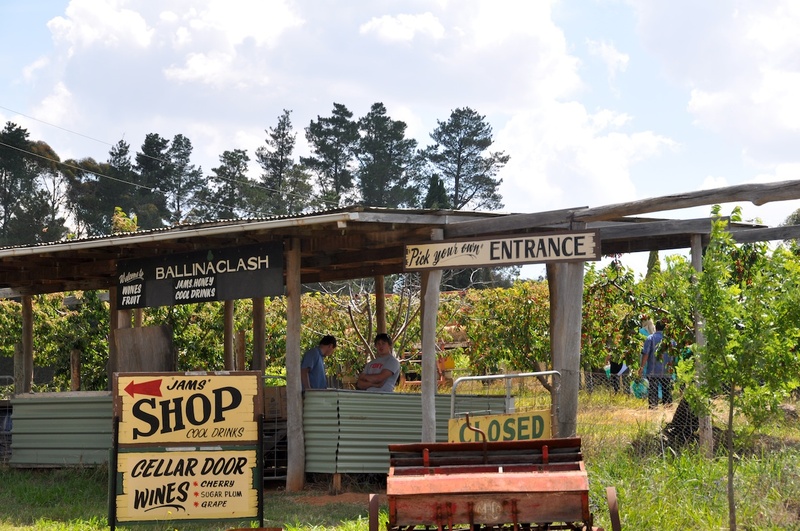 Except the woman at Ballinaclash had recommended stopping at Yandilla mustard seed oil. We had seen it before, but didn’t realize it was actually open to the public. The sign is a bit vague. But then again, we’re still not sure how ‘open’ the tea room and shop really are. The service was a bit…shall we say…non-existent? There was a sign on the door to ring the bell if no one was around; we did that, a few times, but no one showed up. We were honest enough not to just load up the boot with free bootie from the unattended Yandilla store. Mustard seed oil is quite healthy, and tastes like mustard (odd that!). After walking through the place and reading the signs about how the oil is made, we decided to use the honour system: we bagged up some bottles of oil and left some money and a note in the cash register. Sort of like buying horse poo, you take a bag and leave your money. Finally, we were done, with enough goodies in the boot (or ‘trunk’ for our Canadian readers) to last us a few days if we got stuck in a blizzard (ooh, sorry about that… might be a sore point for some of our readers; Edmonton had its first big blast of winter this week, with -25 C temps and blinding snow). Below are some of the fruits of our labour: a pail of cherries, some cherry chutney simmering on the stove, and bowls of delicious strawberries. 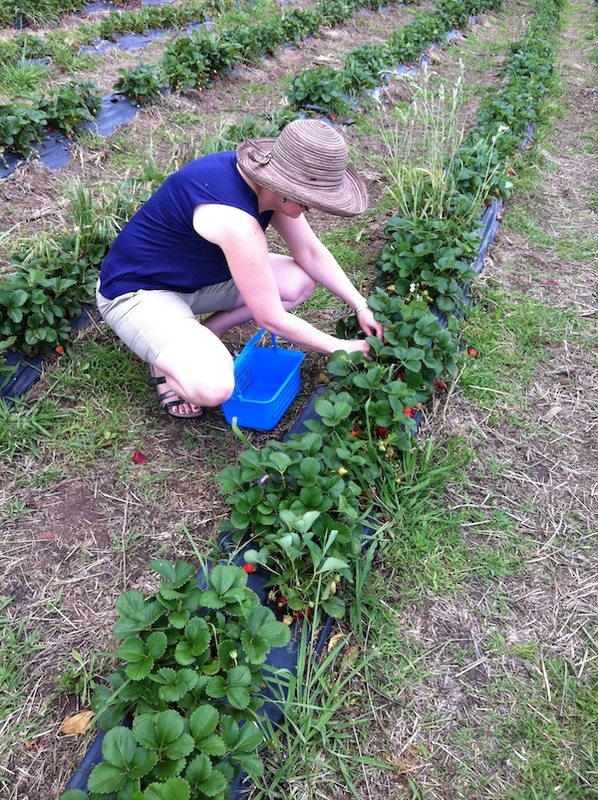 This entry was posted in agriculture, Ballinaclash, cherries, farmers market, fruit, Hilltops, strawberries, wine, Young. Bookmark the permalink. You miss Edmonton. I can tell by your wistful remembrance of the blinding snow. Really it’s been quite peachy and is the perfect weekend with which to be moving. The only thing that could make it more lovely & idyllic is the addition of freezing rain and some zombies. Agreed Sandra. Throw in a plague of locusts and it’s damn near paradise. If anyone is going to get locusts, it will be us. And there is worry of a mouse plague again this year; the snakes feed on those and get bigger and more abundant. And deadly spiders. At least the cold in Edmonton kills most of the vermin! Obviously the lot of you have just been spending way too much time outside this week. Hasn’t anyone told you that you’re supposed to stay inside with a bottle of wine, a cuddly kitteh, and premature Christmas decorations when the weather is like this? Sheesh. OK, so there are a lot of problems in you plan: 1) Our air conditioner needs serviced for spring start up (happening Monday) so it is cooler outside than inside; 2) cuddly kittehs are, what, 450 degree fahrenheit (they aren’t 451, because they can lay on the newspaper without making it burst into flames), so that is a bit uncomfortable in this climate, without said a/c working; 3) you can find wine anywhere, anytime here…looking for a drink at 9 am, just head to a farmers market! And yeah, cool hat! It is my “this might get sweaty” hat. I also bought a nice straw panama for more formal occasions and Lisa is acquiring a collection of straw sun hats that almost (well, no where near actually) rivals her Fluevog collection. Mmmmm…fresh fruit pie for Chrissy! Have a slice for me!